Your car needs repairs but your credit is damaged. You don’t have family or friends who can lend you the money. Your car is the most valuable property you own, and it’s not worth very much because it’s damaged, too. You see an ad for no credit check auto repair loans and you wonder if the truism about something sounding too good to be true applies. You should trust your instincts and run, not walk, away as fast as possible. Instead, let LoanNow provide you with the money you need to repair your car — with repayment terms that will allow you to keep your car. Many so-called no credit check auto repair loans or other personal loans that you see advertised online are not real loans, because the websites advertising them are not real lenders. These websites don’t conduct credit checks because they don’t actually issue loans. 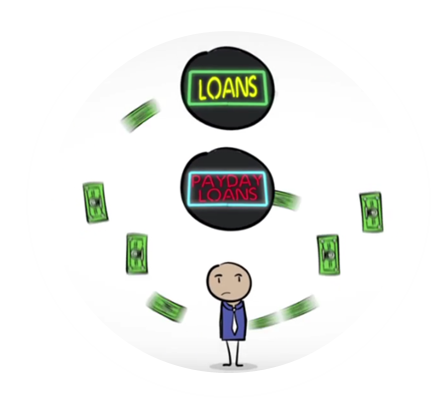 They are payday loan aggregators – third party websites that collect information from potential borrowers and distribute that information to third parities. The receiving entities may or may not be actual lenders. If you submit your information to an aggregator, at the very least, your email inbox may be inundated with SPAM and unsolicited loan “offers” from lenders you may never have heard of. At worst, you could be targeted for attempted identity theft or payday loan scams. Who needs that? Some direct payday lenders advertise no credit check auto repair loans or no credit check vacation loans or other credit check loans. That’s a technically true claim, since payday lenders almost never conduct checks through the three major credit reporting agencies: Experian, TransUnion or Equifax. Instead, they base lending decisions almost exclusively on whether borrowers can demonstrate regular, reliable income. Payday lenders make up for lax underwriting standards by charging prohibitively high interest rates and imposing unrealistically short repayment periods. As it turns out, the name payday loan is painfully accurate. You’re usually expected to repay your loan, in full, with interest, when you receive your next paycheck. If you’re paid every week, your loan would be due within seven days. One particularly dangerous category of no credit checks auto repair loans are auto title loans. With such loans, you relinquish your car title in exchange for a loan granted with few or no questions asked. Auto title loans carry interest rates that are just as prohibitively high as those for payday loans. But auto title loans essentially use your car as collateral. You could conceivably lose a car worth thousands of dollars by failing to repay a loan that originally totaled only a few hundred dollars. Don’t be fooled by so-called no credit check auto repair loans that require you to submit sensitive financial information to an online black hole, repay in full when you get paid or relinquish your car title. LoanNow provides real installment and allows you to repay with manageable monthly installments. Let LoanNow get you back on the road!